Multi-channel marketing communications must include a variety of tactics including email, social, video and yes, good old, proven direct mail. PFL and Sojourn Solutions are teaming to provide that variety to Sojourn's customers. PFL has joined with Sojourn Solutions to bring the power of automated tactile marketing to B2B and B2C marketing organizations. Sojourn Solutions helps marketing teams deliver customer experiences that land at the right time and in the correct context. 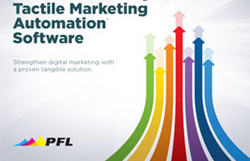 PFL is a marketing technology company focused on bringing the power of automated tactile marketing to B2B and B2C organizations. The partnership allows Sojourn Solutions to offer a wider range of experiences to clients and partners. With PFL’s solutions, dimensional mail, direct mail and tangible marketing sends are fully orchestrated with every marketing channel, automated as part of evergreen campaigns and fully trackable to enable just-in-time follow-up with prospects. With automated tactile marketing, B2B organizations can recognize exponential increases in engagement metrics for marketing programs. “The PFL integration has doubled our efficiency in executing a true multi-channel automated campaign strategy,” noted one of Sojourn’s major financial services clients, a repeat Markie Award Winner.